One of my favorite things to do is to roam Barnes & Noble. Seriously, you never know what book you will find. The perfect testament to this statement is the book I recently finished: Aristotle and Dante Discover the Secrets of the Universe by Benjamin Alire Sáenz. I was casually walking around Barnes and I found myself at the YA Recommendation Wall. Recommendation Walls are my favorite because I always tally how many books I’ve read, how many I want to read, and how many I’ve never seen before. (Yes, I am that much of a dork). Anyway, this book was recommended by 4 employees at the store, and their reason why I should read it, instantly captured my attention. It simply stated: #Allthefeels. Naturally, I couldn’t pass this up and without further ado, I added it to my pile. 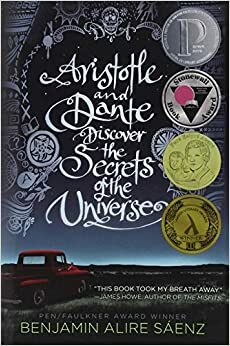 I was so intrigued by this book because I honestly had never seen it before, but it obviously had been out a while and very popular. The title was very interesting and I decided to read it right away. I finished this book so fast, and indeed, dear readers, it contained all the feels. I don’t want to give away too much of the book so I won’t go into details, but it was a very touching story about a teenager struggling to find himself and eventually discovering who he was. I think everyone can relate to the main character, Ari. He tries to analyze who he is, what’s missing from his life, and why he acts a certain way. The biggest theme that I took away from this book is that one person can truly make a difference in your life. You might not be expecting it, you might not necessarily want it, but one person can alter your life and send you on a different course. I think that is a very comforting thought. There are so many people who I have yet to meet, and I can’t even guess how they would affect my life. I would definitely recommend this book for people to read, but please remember #Allthefeels is entirely accurate. Further proof of that is the category I choose for my 2016 challenge: “a book that made you cry”…see, I did shed some tears while reading this. Anyway, I hope everyone is having a great summer! Read anything fun lately?